The following families have genealogy eBooks on this page: Andrews 1530, Baker, Bayne, Chase, Dimock, Ewing, Fletcher, Gale, Hepburn, Knauss, Lichtenwalner, Northend, Odlin, Parthemore, Purmort, and Schenck families. Welcome to Bookshelf 17 at Hawkeyes Trading Post! Andrews Family History and Genealogy PDF eBook English 4.42 MB Year 1917. This Andrews family genealogy provides vital dates that range from 1530 up to 1917. A period of over 385 years! There are numerous rare ancestral photographs, authenticity of the Andrews family Coat of Arms, and resources from both England and America referenced. This is an excellent account of the Andrews family legacy for any family member! A great genealogy resource! Price $6.95 USD. Baker Family History and Genealogy. PDF eBook English 2.42 MB 1901. Aboard the Rebecca on August 8th of 1685 Baker family ancestor Henry Baker arrived in the New World. Through the thick forests he migrated to Lancaster, Pennsylvania. These are his descendants that have multiplied and spread across North America. 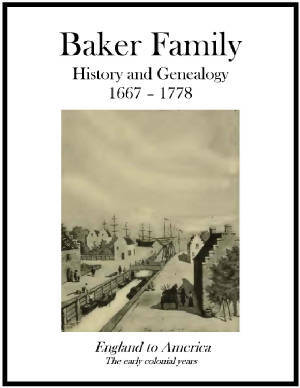 Wills, Parish Records, and Quaker Records are contained in this book along with vital dates ranging from 1667 to 1778 for the genealogy of the Baker family genealogist! Price $6.95 USD. 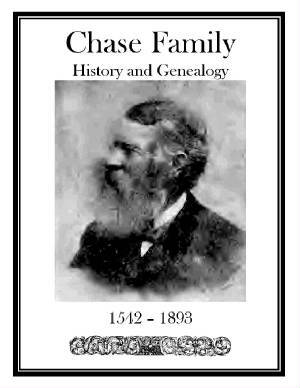 Chase Family History and Genealogy PDF eBook English 1.0 MB Year 1894. This publication provides information on the Chase Family Coat of Arms, the Family Crest, and history that extends from 1542 up to 1893. A period of over 350 years! Although this eBook contains only 19 pages it is packed with a history that may be a unique source of information for Chase family genealogists! Price $6.95 USD. Ewing Family History and Genealogy PDF eBook English 13.2 MB Year 1919. This fascinating publication contains the family legends that date back to Scotland in the year 1177. With 26 illustrations, including rare family etchings, an index of 44 pages containing over 1500 descendants and in-laws, this is a wonderful Ewing family resource! Vital dates range from 1695 to 1918 on Ewing ancestors, and the Family Coat of Arms is also presented with the history. 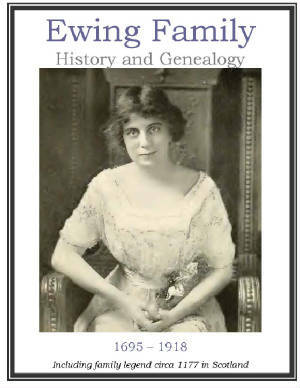 An excellent eBook on early Ewing family genealogy! Price $6.95 USD. Gale Family History and Genealogy. PDF eBook English 4.51 MB 1909. The legend of the Gale family name is discussed, and extends from the Scottish Highlands back to the year 1273. A delightful speculation also continues back to the Roman occupation in 55 B.C. Over 20 rare ancestral photographs, 5 generations, and references to the publication Gale Family Records in 1866 is herein contained. 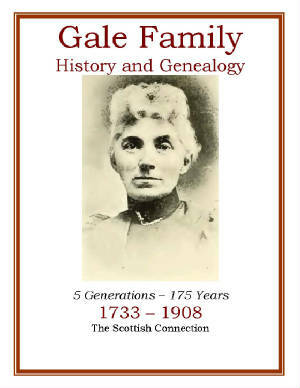 Essential genealogical dates range from 1733 to 1908 providing 175 years of family genealogy for the Gale family historian! Price $6.95 USD. 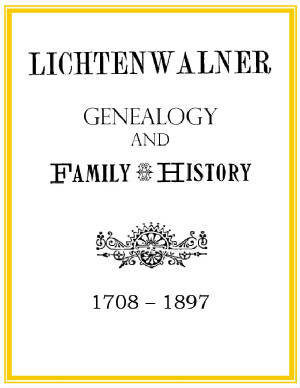 Lichtenwalner Family History and Genealogy. PDF eBook English German 7.96 MB 1900. Johannes Lichtenwalner was born in Kolmberg, Germany in 1708. He immigrated in 1733 to Colonial America and carved his life into the Pennsylvanian frontier. Vital dates range from 1708 to 1897 providing 189 years of genealogical information for the family historian. An index of 27 pages lists over 1200 descendants and related in-laws. An excellent source of Lichtenwalner ancestry for family members anywhere in the world! Price $6.95 USD. 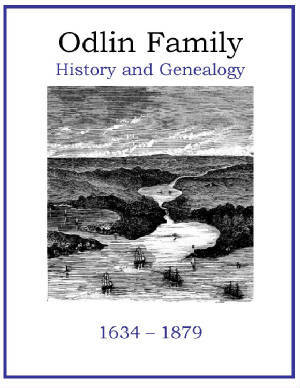 Odlin Family History and Genealogy. PDF eBook English 797K 1887. The family legacy begins with John Odlin of Colonial America Boston who is considered the progenitor of the Odlin family in the United States. Vital dates range from 1634 to 1879 providing 245 years of genealogy for the Odlin family historian. This is a condensed publication of only 8 pages. Yet the researcher may find that it provides unique documentation on genealogy only available from this resource! Price $6.95 USD. Purmort Family History and Genealogy. PDF eBook English 11.4 MB 1907. 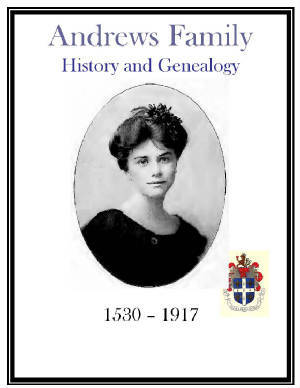 This superb publication of the Purmort family legacy contains 97 rare ancestral photographs, poetry, the Purmort Family crest, documentation of 9 generations in England with an additional 10 generations in America, an index of 13 pages with hundreds of names, and much more! Vital dates range from 1627 to 1907 providing 280 years of genealogical information for the Purmort family historian! A great resource for any family member anywhere in the world! Price $6.95 USD. 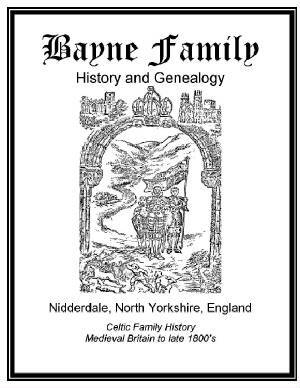 Bayne Family History and Genealogy PDF eBook English 18.1 MB Year 1896. This remarkable publication steps back to medieval Britain, and early Celtic History with numerous deeds and registers that document names and time periods of Bayne Family members in history. There is a list of pedigrees, Pictish Chronicle references, and the family seal of the Arms of Bayne. 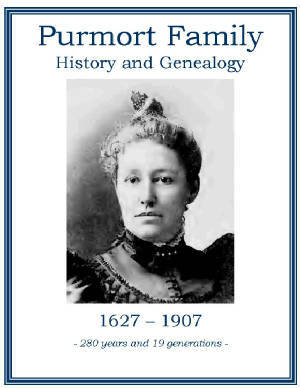 This is a compelling account of Bayne family accomplishments throughout the centuries for the Bayne family genealogist! Price $6.95 USD. Dimock Family History and Genealogy PDF eBook English 2.38 MB Year 1899. Sir Robert Dymock and descendants acted as Kings Champions for 30 coronations since Englands King William the First. The family legend is extraordinary. Through the centuries descendants migrated to the New World of Nova Scotia, Massachusetts and New Jersey. This intriguing publication contains vital dates for descendants that range from 1637 to 1899. Over 260 years! 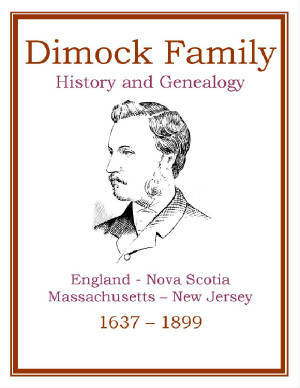 An excellent source of Dimock family genealogy for your reference! Price $6.95 USD. 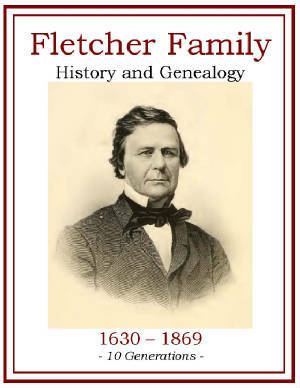 Fletcher Family History and Genealogy PDF eBook English 14.8 MB Year 1871. This publication is an account of 10 generations of descendants of Robert Fletcher who resided in Concord, Massachusetts in the early 1600s. Vital dates range from 1630 to 1869, and the eBook index lists over 1200 descendants and in-laws! Covering over 230 years this is an excellent genealogical resource for the Fletcher family genealogist! Price $6.95 USD. 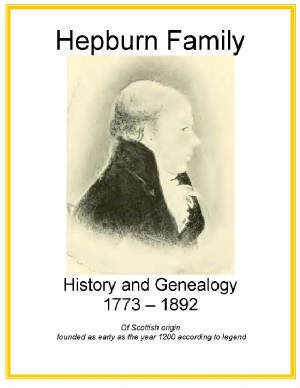 Hepburn Family History and Genealogy PDF eBook English 9.11 MB 1894. The family origin dates back in Scottish history to as early as the year 1200 according to family tradition. In this publication there are many rare ancestral etchings, photographs, and poetry with short biographies on many family members. Vital dates with descendent names range from the year 1773 to 1892. Print out the pictures for your own photo frames! Extraordinary information for anyone in the Hepburn lineage interested in family genealogy! Price $6.95 USD. 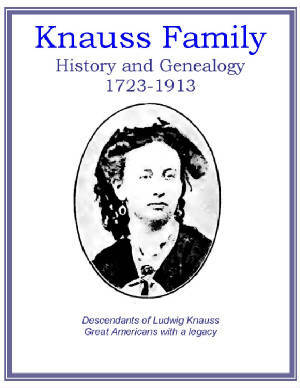 Knauss Family History and Genealogy PDF eBook English 15.2 MB 1915. There are numerous rare ancestral photographs, historical etchings, and photos of ancestral homes in this fine publication. A 24 page index and vital dates for genealogy that range from 1723 up to 1913 are contained in these pages. Clearly, a very patriotic American family that dates back to colonial America. A wonderful resource for the family genealogist! Price $6.95 USD. Northend Family History and Genealogy. PDF eBook English 1.70 MB 1874. Vital dates covering 235 years, that range from 1638 to 1873, are provided in this documented genealogy for Northend family ancestors. There are 7 generations and fresh insight listed in this condensed rare publication of 15 pages. 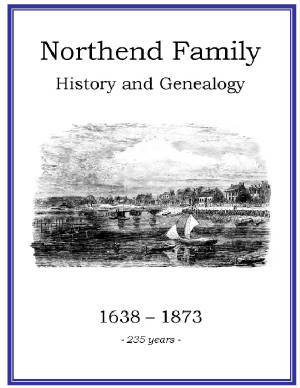 A substantial reference for any Northend family genealogist! Price $6.95 USD. Parthemore Family History and Genealogy. PDF eBook English 15.3 MB 1885. 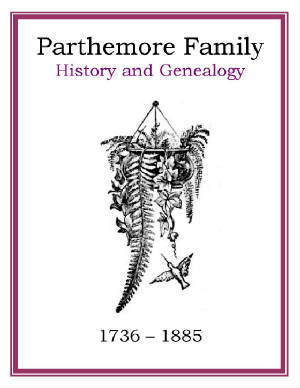 This publication contains a cornucopia of information on the Parthemore family tree. Within the pages you will find poetry, 6 generations of descendants, and a 28 page index with over 1500 names of ancestors and in-laws. Vital dates range from 1736 to 1885 providing 149 years of genealogical information for the Parthemore family historian! 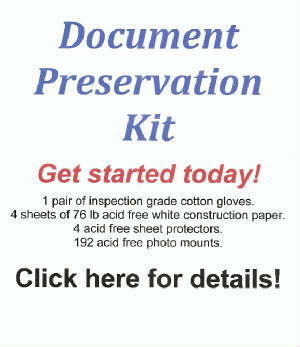 An excellent genealogical resource! Price $6.95 USD. 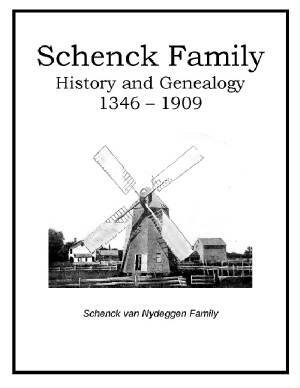 Schenck Family History and Genealogy. PDF eBook English 6.25 MB 1911. The family legacy dates back to Holland and the Schenck van Nydeggen family of the 14th century. There are many rare ancestral photographs, the family crest, 10 generations of family members, and a 28 page index documenting over 900 family relations. Vital dates range from the year 1346 to 1909 providing 563 years of genealogy for Schenck family historians! An excellent resource! Price $6.95 USD.